My spring beehive check was good! I checked my hive thoroughly a couple days ago for the first since last fall. I thought it looked pretty good, but definitely have question being a new beekeeper and all. There used to be two hives, but one swarmed and was abandoned last summer. The second one entered winter with a brood chamber in the bottom super, an empty honey super and then a regular super full of honey. In my check on Sunday, the top super was almost full of honey, capped and uncapped. I’d guess it was about 75 percent full. The middle honey super did not have any honey, but it looked like the bees were beginning to draw comb out on the plastic foundation. 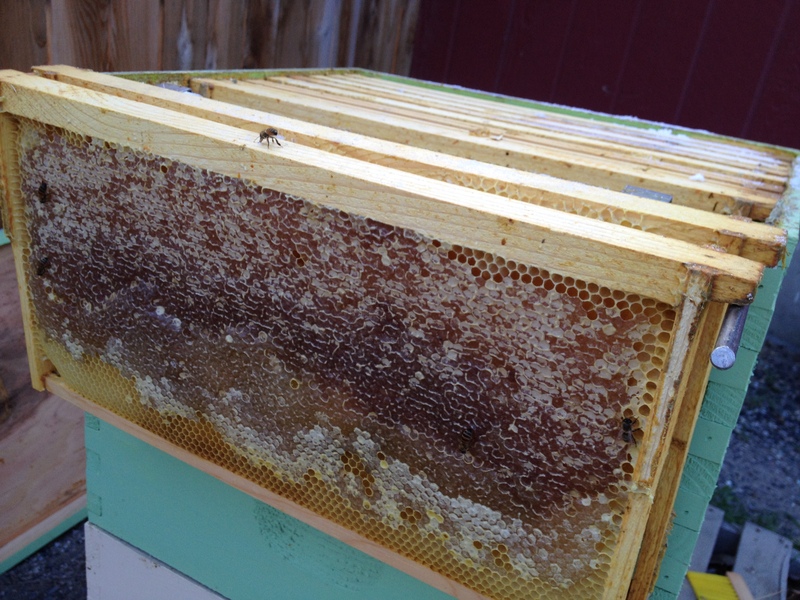 Most of the frames in the upper super had capped honey left over from last winter. It also has a lot of what looks like new honey. The bottom super had mostly bees, some honey and some pollen. I would say that bees might have been covering three of the frames. Most of the frames, if not all, had drawn comb, but most of it was empty. There was some honey and some pollen in the outer frames. 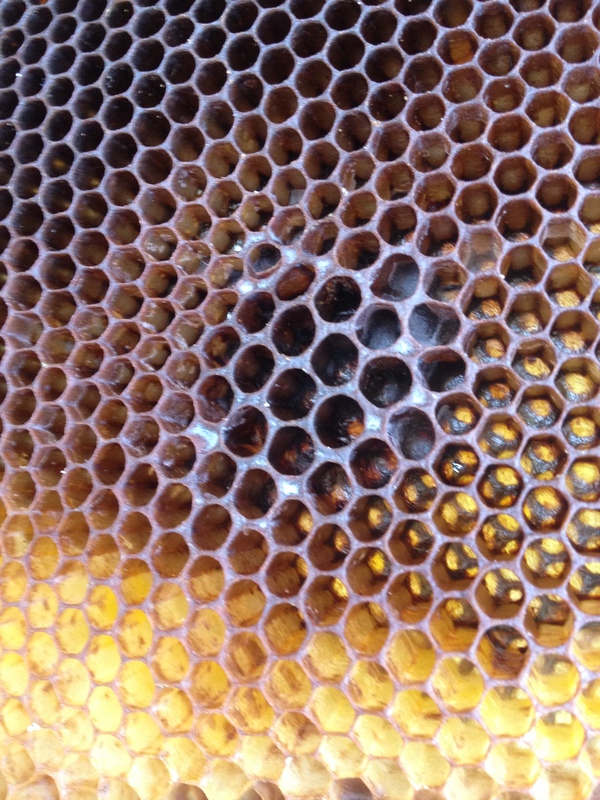 Also in the outer frames were bees lodged in the cells with their tails sticking out. One of these areas seemed to be covered with something that looked like mold. This frame had bees that looked like they starved and some mold on the comb. I found the queen in one part of the hive. She was not marked, so clearly she was a newer queen since the one I purchased last year was marked. She seemed to be laying well. There was a lot of capped and uncapped brood. Although there was probably not as many bees/brood in there as I was expecting. So here’s what I did. I removed the middle, empty honey super, which was probably a mistake, since it didn’t give the bees a whole lot of room to expand. But here’s what I’m going to do. Tonight, I’m going to add a third super and stagger full honey frames with empty farms in both of the supers. I don’t know what that moldy looking stuff was near the other starved bees. And, I’m assuming the bees will remove the starved ones once they need the space for brood. So here are my questions? Should I have more bees at this point? What’s that mold stuff? Do I need to remove that part? And is there something I need to do to keep them from swarming? 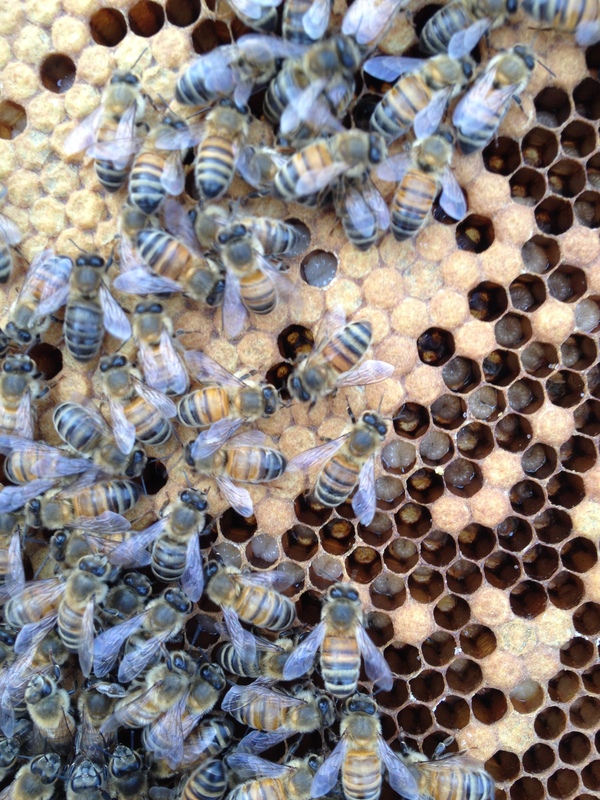 In the bottom super was the queen, capped brood and larvae. Don’t know if this is old or new drone comb. I believe the mould happens when the hive gets too moist, because there are not enough bees to keep it at the correct temperature. Based on this I think they are unlikely to need more space at the moment and even less likely to swarm. During swarm season, which is late April to August in my part of the world, you should check the hive weekly for queen cells. 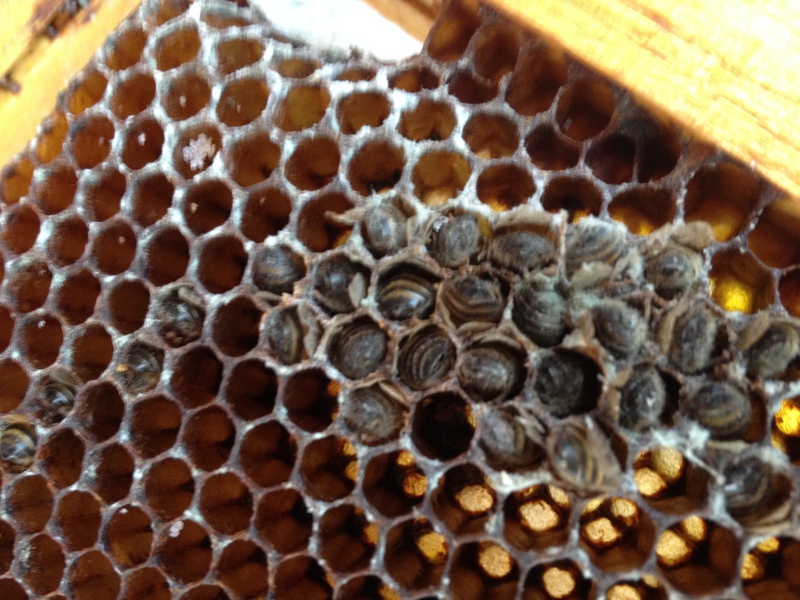 As soon as you spot an uncapped queen cell you can then take action to do an artificial swarm. It would be a good idea to get spare equipment ready for that now. I would get rid of the mouldy frame personally, if you have a spare frame you can replace it with. Thank you for reading. I hope to be more diligent about posting this year. And I look forward to reading your blog, as well. Oops ignore my other comment sorry – didn’t realise you wrote the post in 2014!